Mesothelioma metastasis means the cancer has spread beyond where the tumors originated, limiting treatment options and negatively impacting life expectancy. Metastasis occurs as mesothelioma becomes more advanced. The cancer will spread to different organs based on the type of mesothelioma. By stage 4, the mesothelioma has the most distant spreading. Metastasis can greatly limit the treatment options available. Malignant mesothelioma has a reputation as an aggressive cancer because of how the mesothelioma cells can quickly grow and spread throughout the body. Unfortunately, since the cancer has such a long latency period and nonspecific symptoms, a proper diagnosis often isn’t made until the disease has already metastasized and reached a more advanced stage. Metastatic mesothelioma is generally associated with stage 3 and stage 4, meaning the cancer has likely reached the lymph nodes and more distant organs. At this point, patients may be limited to palliative treatment options and have a prognosis of about one year. One of the main reasons mesothelioma is considered so dangerous is how quickly the cancer can spread locally, regionally and even throughout the body. Mesothelioma cancer can spread a number of ways, but most commonly involves cancer cells moving through the bloodstream, lymph nodes or lymphatic system. Mesothelioma may also spread by a process known as angiogenesis, which occurs when new blood vessels develop and allow the cancer cells to grow faster and develop more tumors. By any of these methods, the cancer can potentially spread anywhere in the body. In general, mesothelioma isn’t considered to be metastatic until stage 3 and stage 4. In the earlier stages, patients may experience some limited spreading of the cancer cells to neighboring tissue, but it is generally rather localized. Regardless of the type of mesothelioma, by stage 3 and stage 4 of the disease, the cancer is considered much more advanced and may have traveled to distant organs. As the cancer spreads, prognosis becomes much more dire, as it is increasingly difficult to kill or remove cancer cells that have spread throughout the body. Mesothelioma cells may also metastasize elsewhere, depending on where the primary tumors first developed. At diagnosis, the type, cell type and stage of disease are the primary factors that help doctors determine how the cancer can be expected to develop and spread. With a thorough understanding of the mesothelioma pathology, a specialist can then determine a personalized treatment plan to hopefully improve life expectancy. Malignant pleural mesothelioma first develops in the lining of the lungs or the pleura. After asbestos exposure, the fibers can become trapped in the inner or outer pleural membrane and eventually develop into tumors. Pleural mesothelioma patients often display a sheath-like formation of tumors across one lung as it first develops, which can then easily spread across the pleural cavity. Patients diagnosed with pleural mesothelioma most commonly have the epithelioid cell type. Epithelial cells are known to quickly divide and grow, but are slower to metastasize because the cancer cells tend to stick together. In a clinical trial spanning from 1992 to 2016, researchers studied 165 malignant pleural mesothelioma patients to get a better understanding of how the disease commonly spreads. Over 80% of the participants displayed the epithelial cell type. Researchers found that over 60% experienced more regional spreading, such as pleural effusions and metastasis to the other lung during this time period, with about 30% also seeing the cancer spread to the lining of their heart (pericardium). While distant spreading was more rare, researchers noted that they found a higher frequency of unexpected sites of metastases in this study. About 20% of patients experienced rare mesothelioma bone metastasis, and even 3% of the participants had symptomatic spread to the brain. On average, these patients survived for 24 months after diagnosis. Mesothelioma tumors can also develop in the lining of the abdominal cavity (peritoneum), causing peritoneal mesothelioma. Since there are only about 500 new cases each year, how the disease develops and spreads isn’t nearly as well understood as pleural mesothelioma. Like pleural mesothelioma, many cases of peritoneal mesothelioma also consist of epithelioid cells. However, biphasic cells and occasionally pure sarcomatoid cells have also been most commonly found in peritoneal mesothelioma. Sarcomatoid mesothelioma is considered the most dangerous because these cells closely resemble healthy cells under a microscope, making it even more difficult to diagnose. Additionally, these cells have a higher growth rate and do not clump together, making it easier to travel through the bloodstream and spread to more distant organs. Biphasic mesothelioma is a mix of epithelial and sarcomatoid cells, and its likelihood to metastasize is dependent on which cell type is most dominant. Research has found that peritoneal mesothelioma patients tend to experience more localized and regional metastasis than distant. More than 50% of cases typically spread to other organs within the chest wall and abdominal cavity, like the appendix, pancreas and kidneys. In some instances, studies have found more aggressive spreading to the lungs, thyroid, or heart. Similarly to pleural mesothelioma, metastasis to the bones and brain is extremely rare and not well documented. In general, pericardial mesothelioma is the most difficult to detect and properly diagnose because of its extreme rarity. Unfortunately, the majority of these patients aren’t diagnosed until posthumously. The original tumors develop in the pericardium or lining of the heart, only accounting for about 2% of all mesothelioma cases. In a few studies that have observed the metastatic cancer, researchers have found the cancerous cells may spread through the heart and the pulmonary artery, which ultimately enables the cancer to progress more aggressively throughout the body. In some cases, new tumors have been found in the lungs, chest wall, abdominal cavity and lymphatic system. 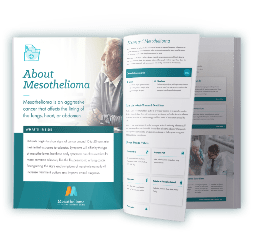 As with any metastatic disease, as the cancer spreads and impacts other organs and parts of the body, mesothelioma patients will experience new and worsening symptoms. The nature and frequency of these symptoms will depend on where the cancer has spread and the size of the new tumors. For patients facing worsening symptoms, overall health will also deteriorate and make it more difficult to tolerate the aggressive treatments typically recommended for mesothelioma. As the cancer spreads and causes worsening symptoms, the expected survival time also worsens. At these more advanced stages of cancer, patients on average only survive about a year or even less if they are facing more severe metastases. The goal of cancer treatment is to stop the cancer from spreading, control the cancer’s growth rate and kill the tumor cells. But with metastatic mesothelioma, it is often too late for patients to undergo curative treatments. With further spreading, treatments like surgery are no longer an option as they become too dangerous for the patient. Other standard treatments like chemotherapy or radiation therapy may still be recommended, but as palliative treatments to help reduce symptoms and improve quality of life. Even at these advanced stages of disease, however, clinical trials may be available to potentially extend survival. Emerging treatments like photodynamic therapy and immunotherapy have shown promise even among patients with severe metastatic mesothelioma, extending survival for some patients to even three years or longer. It’s important for patients to work with a mesothelioma specialist to determine the best treatment plan for their case. 1 Bridda A, Padoan I, et al. Peritoneal Mesothelioma: A Review. Medscape General Medicine. 2007; 9(2): 32. 3 Collins D, Constantinidou A, et al. Patterns of metastases in malignant pleural mesothelioma in the modern era: Redefining the spread of an old disease. Journal of Clinical Oncology. May 2017; 5: 8556-8556. 6 National Cancer Institute. Metastatic Cancer. February 2017.